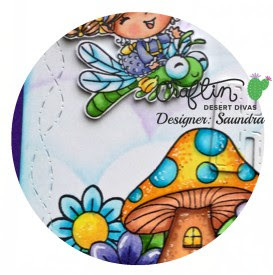 I am back to share another look at the new Gnomie Stamps and the new Stitched Alpha Dies from Craftin Desert Divas. This card has got to be one of my all time favorites! 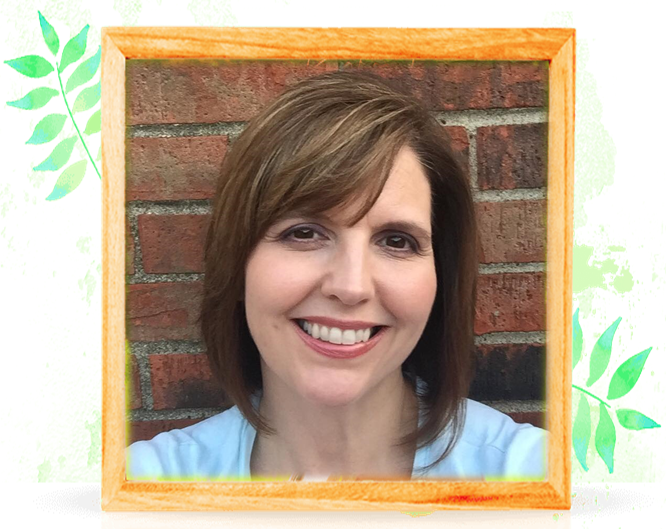 I just loved putting this one together! 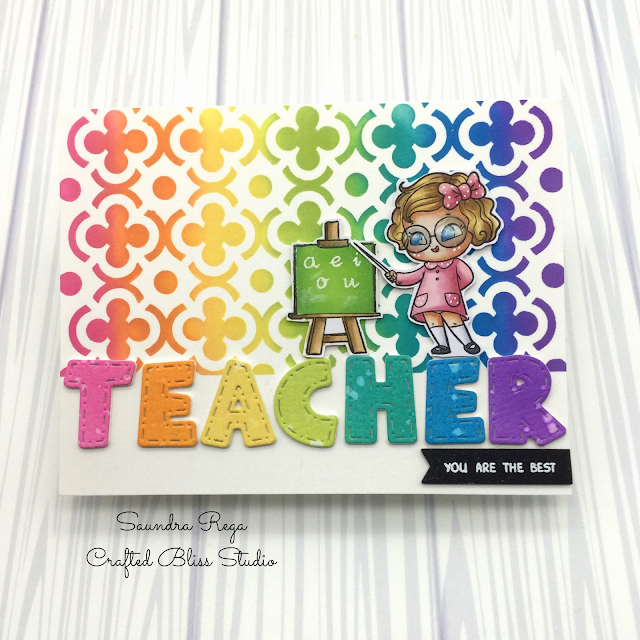 For this card I started with a base that I die cut with the CDD Crazy Stitched Frames Dies. 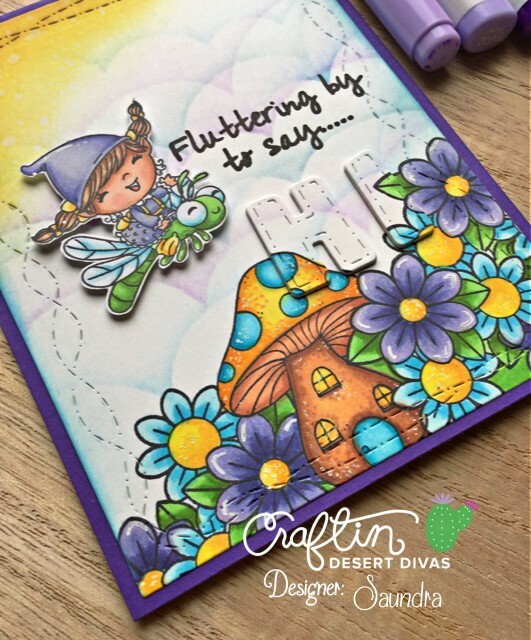 I stamped and masked stamps from the CDD Busy Bees Stamps and the Whimsical Wishes Stamps along the bottom of my panel. I stamped this darling little girl gnome from the new Gnomie Stamps on a separate piece of Copic friendly paper. All of the images were colored with Copic markers. Once I was happy with the coloring, I used a stencil that I created from the CDD Stitched Scallop Dies and inked my sky with Distress Oxide Inks in Salty Ocean, Broken China, and Wilted Violet. To one corner I added some Fossilized Amber and Spiced Marmalade. I added a few water droplets and soaked them with my paper towel to create a little texture. With everything colored it was now time to use the new Stitched Alpha Dies. I die cut several pieces of white cardstock and them I cut the word Hi from my colored panel. I stacked all of the my white pieces first and glued them together. I glued my panel to my card base and added the letters to the opening I had from die cutting the letters. Finally I added my colored pieces on top. This created some dimension and it looks awesome in real life. I stamped a sentiment from a retired CDD stamp set that is no longer available. It just worked with this card so I decided to use it. 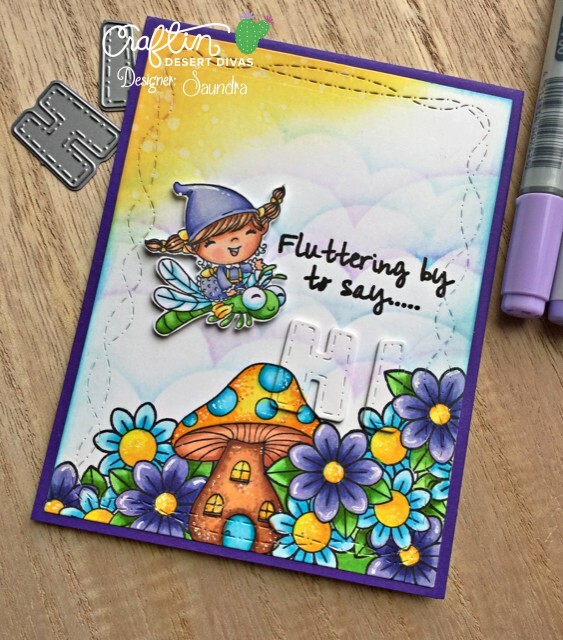 Finally it was time to add my little flying gnome from the new Gnomie Stamps. I popped her up on the card with some foam tape. I hope you adore this card as much as I do! 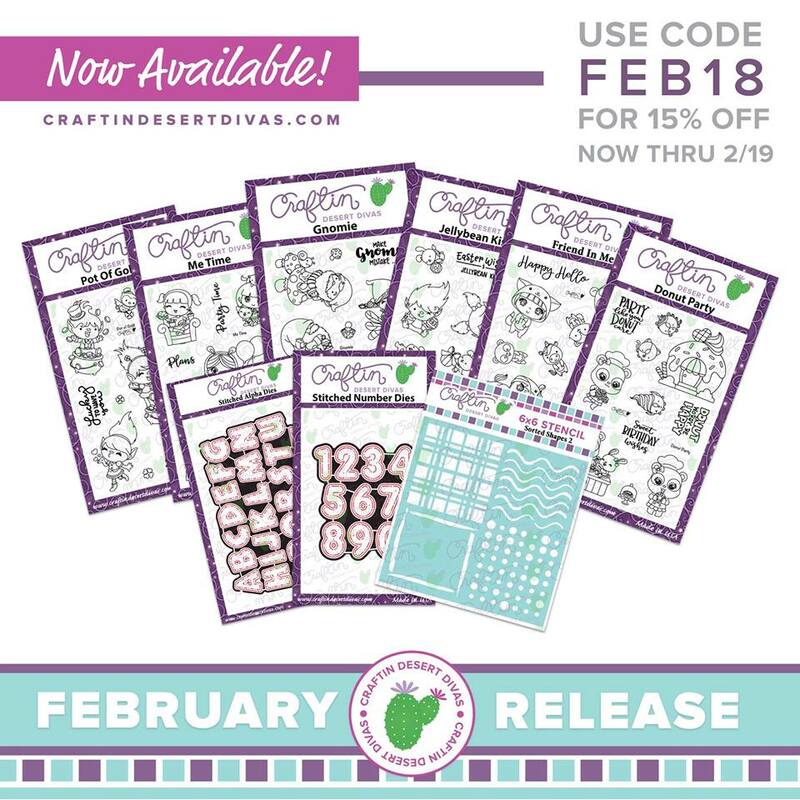 Be sure to check out the Craftin Desert Divas Sale that is going on right now! Disclosure: I am an affiliate for Craftin Desert Divas. By clicking the links contained in this post I receive a little compensation but you will not incur any extra charges when purchasing these items.